The year 2016 saw some major developments at the top end of the optics market, with both Swarovski and Zeiss releasing new ranges of scopes, so Leica’s update of the Televid range will inevitably be seen as the third big player of the optics world trying to keep pace. First impressions are that Leica has wisely built on its already very considerable strengths. The Televid 82 looks remarkably small for a scope with an 82mm objective lens, and it feels light, too – having used the wonderfully compact Ultravid 8x32HD bins for some time, I already know how good Leica is at packing a lot into a small package, and this scope keeps up that emerging tradition. The 25-50x wide angle zoom eyepiece fits quickly and securely using a bayonet fitting, and produces a bright, very sharp and natural-looking image. A field of view of 41m@1,000m (using 25x magnification), is very wide indeed, and it feels it, too, with sharpness maintained right to the edges. Even at maximum zoom, there’s no feeling of claustrophobia, with field of view 28m@1,000m. That, in turn, meant that I used the zoom far more than usual. It is controlled by twisting the eyepiece, and moves smoothly and moderately stiffly. Colour fringing was nearly impossible to find, even against bright sunlight, and the scope also performed extremely well in low light – this is an all-rounder that can handle most situations. There’s a split focus wheel, with the main wheel over a finger wide, and the fine focus around a finger wide. Well ridged for grip, they were easy to use even with gloves on, and they are well enough separated to avoid any mistakes. The main wheel does have a lot of travel, taking almost five full clockwise turns from close focus to infinity. Travel is slightly stiff but smooth, and the fine focus wheel is excellent, making it easier to find that extra bit of precision in your focusing. Close focus, incidentally, is just under four metres, highly impressive if you plan on using your scope for more general wildlife-watching. The eyecup twists up and down to two positions, and stayed in place well, and while it offers good eye relief and is comfortable in extended use, some might prefer that it had at least one intermediate position. The rubber rim of the eyecup was a little loose on the test sample, but it’s a problem that could be very easily fixed. Build quality in general is excellent, as you’d expect, with solid rubber armouring, good waterproofing, and the peace of mind that goes with a Leica warranty. The new Televid APO 82 is far more of a traditional scope than the recent releases from its rivals, but what a scope! 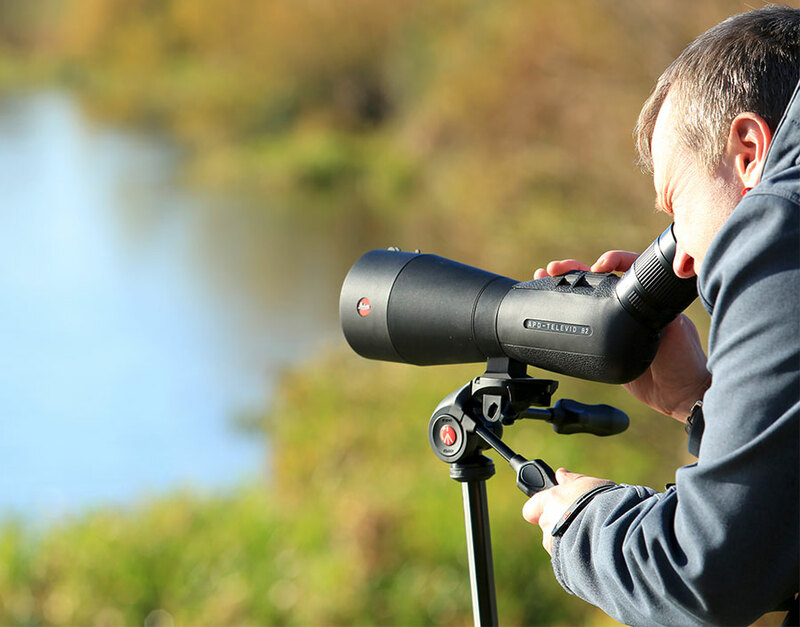 It seems to have been designed with ease and pleasure of use in mind, because the dinky size and low weight make it easy to carry around all day, while that eyepiece produces great results without putting undue strain on the eye. Take a look, and add it to your list of possibilities.